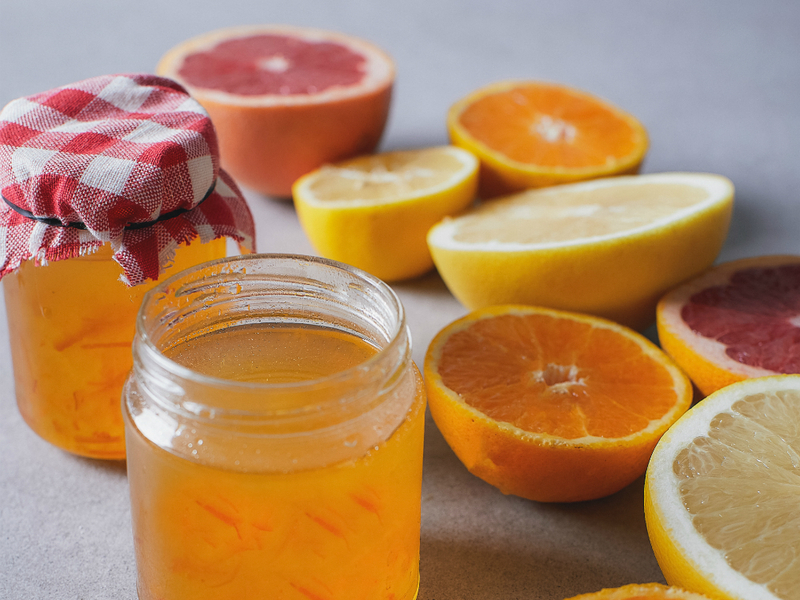 An alternative to the traditional orange-only, this interesting and delicious marmalade will have tastebuds popping with beautiful citrus flavours. Adult supervision required. To sterilise jars and lids, wash them in hot soapy water, then rinse them in hot water. Place in a stockpot of boiling water for at least 10 minutes. Drain jars upside down on a clean tea towel and dry them thoroughly in a 150°C oven. Remove the jars from the oven and fill while still hot. 1. Place the saucer in the freezer to chill – you’ll need it cold to test the set of the jam. 3. Cook the fruit in the water on a low heat until it is soft and transparent, then add the sugar. 4. Cook, stirring, until the bubbles become glassy. 5. To test for setting point, put half a teaspoon of the hot marmalade onto your chilled saucer. Allow to cool a few seconds, then push it with your fingertip. If it wrinkles up, it’s ready. If it’s not yet ready, you may need to add up to 50 g of pectin to set. Add pectin and cook for a further 5 minutes. 6. When it has reached setting point, very carefully pour the marmalade into the heat-proof jug and then into sterilised glass jars and screw the lids on tightly. Turn the jars upside-down for 10 minutes or so to allow the fruit to settle. Don’t forget to label the jars with the date.